Because our batch sizes are typically small compared to commercial brews, one problem many all-grain homebrewers have is maintaining their mash temperature. Ideally, mash temperature should remain relatively constant throughout each rest. 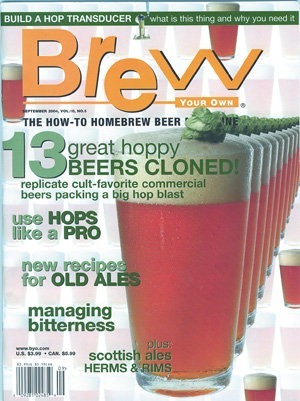 Clone recipes to recreate your favorite commercial hoppy brews, including: Dogfish Head’s 90-minute IPA, AleSmith IPA, Three Floyd’s Dreadnaught, Hop Rod Rye, Racer 5 IPA, Russian River’s Pliny the Elder, Rogue Imperial IPA, Lagunitas IPA, Acme IPA, Elissa IPA, Sierra Nevada Celebration Ale, Bell’s Two Hearted Ale and Stone Brewing’s Ruination IPA. Bell’s flagship IPA is brewed with 100% Centennial hops from the Pacific Northwest and named after the Two Hearted River in Michigan’s Upper Peninsula. First brewed in 1981, Sierra Nevada explains that Celebration Ale is one of the earliest examples of an American-style IPA, and it’s still one of the few hop-forward holiday beers. The intense, hop-heavy beer features Chinook, Centennial, and Cascade hops. The flagship IPA that Lagunitas built their brewing name on is a well-rounded West Coast IPA with lots of hop complexity and a solid malty balance. Part of Rogue Ale’s XS series of beers, their I2PA features an intense hopping regiment and is aged for 9 months before leaving the brewery. Originally brewed to be part of a first-ever “Double IPA festival” back in 2000, Pliny has become the standard by which many modern double IPAs are measured. As with any hop-heavy beer, Pliny is best enjoyed fresh, while the massive hop aroma is at its peak. This full-bodied West Coast IPA is one of America’s most medal-winning IPAs. This high-gravity IPA is brewed with 18% rye malt and has a floral hop aroma and caramel notes. This unforgettable imperial IPA features an intense citrus hop aroma and a huge malt body.